“A smile is always in fashion” is the most perfect quote to describe this fashion forward Orlando multi-cultural wedding celebration. An Orlando destination wedding was perfect for this cosmopolitan couple. Tehsina is the biggest Disney fanatic and has been since she and her family traveled here from Canada when she was a little girl. 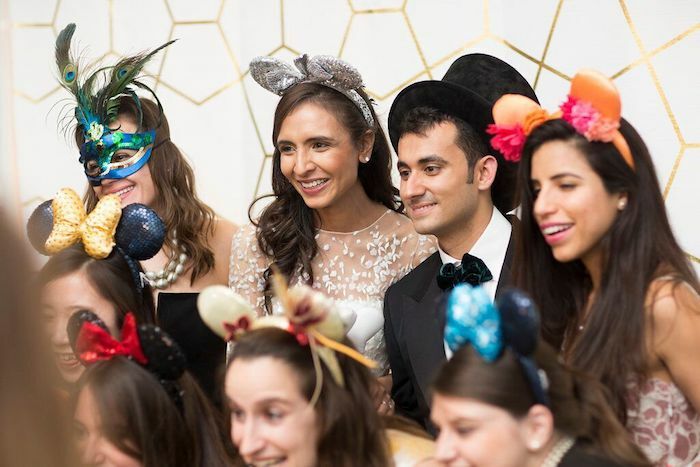 Her family traveled from Canada and England with Ghadeer’s family traveling from New York and the couple traveling from Boston for the wedding planning. The elements of this chic stylish wedding design reflect Tehsina’s Muslim heritage as well as Ghandeer’s Arabic family background. Her stunning Oscar de la Renta taffeta gown with fleur sequin and floral lace overlay, an illusion neckline, and three-quarter length sleeve were all beautiful touches for this modest gown. 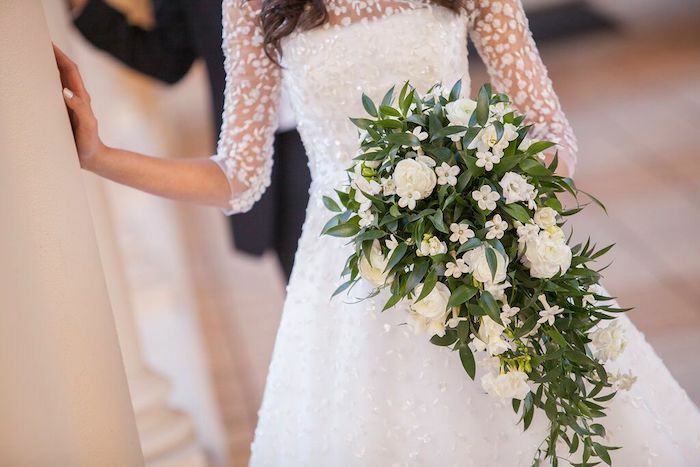 Tehsina carried a long cascading bouquet of Italian ruscus, white ranunculus and several dozen fragrant stephanotis; the perfect accent to her simple, elegant wedding gown. The best part? It was an exact replica of her mother's bridal bouquet that Jesus with Raining Roses expertly created. The look on Tehsina's mother's face when she (surprise!) first saw the bridal bouquet is what a wedding planner's dreams are made of! Even after a First Look and some private time together, Ghadeer, looking smashing in his Tom Ford tuxedo, smiled lovingly as his bride made her entrance escorted by her parents. Beautiful contemporary arrangements of giant white calla lilies and monstera leaves in tall glass vases filled the aisle to the Ritz Carlton’s gazebo, draped in soft, flowing white fabric. Modern Lucite boxes topped with geometric cubes and cascading white hydrangea and hanging amaranthus flanked the couple as they exchanged vows. Following the ceremony, guests enjoyed cocktail hour on the Tuscany Terrace while the newlyweds took a sneak peek at the luxurious, modern reception décor. 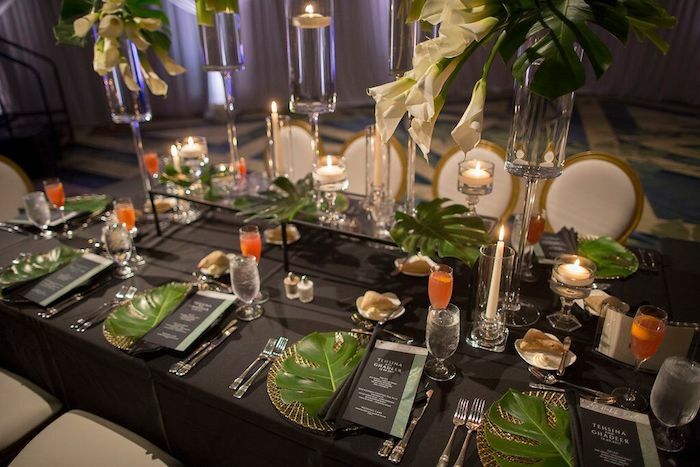 Simple black linen allowed the modern metal and glass risers filled with cylinders of floating candles and breathtaking white calla lilies to take center stage. 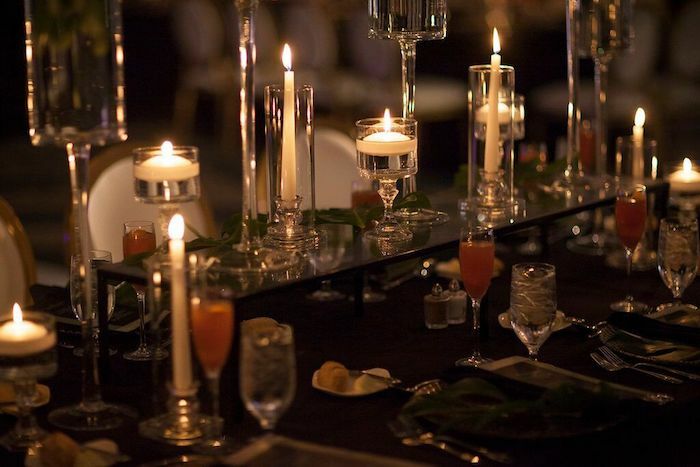 Tall contemporary arrangements connected long guest tables surrounding the custom black and white dancefloor. The look was completed with gold chairs, gold embellished glass chargers topped with monstera leaves and custom designed menu cards, and a sleek, marble veined wedding cake. Tehsina and Ghadeer made a grand entrance with a Zaffa, a wedding march of crossed swords, dancing and drums; an ancient Arab tradition. After an evening of dinner and dancing the newlyweds made their dramatic departure through a shower of sparklers.